I've mentioned drifting into compressed white teas recently, and I think this last purchase and review are going to be where it all levels off for awhile. I left behind a gong mei version a couple months back, at the Teeta Talk shop--not far from Central Plaza Rama 9, for people in Bangkok. I kept wondering about that tea, and since I happened past that shop not too long ago I bought it too. I don't know much about that specific version, or the type, except that it's described as a higher grade (quality level) than shou mei, with bai mu dan above that. Bai hao yin zhen (silver needle) is sort of a different thing, made from only buds, while the others are leaf and bud material white teas. This is going to go long. I'll add a section covering some background issues first so I won't get far with research or tea descriptions, and hopefully the taste-by-taste part can be a little thinner this time. I tend to focus on flavor versus other aspects when things get complicated, likely how this will work out. Passing on a general idea will do; no need to describe the last aspect of every version. I've tasted all these teas, so that should make it simpler on my end. Onto a brief description of what these even are, then some background first, then tasting notes after. Tenfu gong mei cake (online vendor reference here): it's interesting looking for an example online and finding one for under $5 (but then that's vending related to Taobao, if that means anything, the Chinese version of Ebay). I was never under the impression that this was rare, exceptional quality tea but the last search I did put online sources in the $15 range (related to a Western vendor I'm not turning back up), and I've just bought this for a bit under $20. None of that affects how the tea comes across, really. I've wondered If there is any chance a modest tea version like this could be fake but it almost wouldn't matter, unless it wasn't as good as the original, which is how that is supposed to typically go. Gong Mei is a white tea made of the Da Bai subvarietal of Camellia sinensis. It is grown mainly in the provinces of Fujian and Guangxi in China. 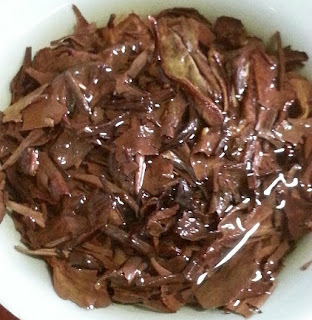 Because this tea is harvested later than Bai Mu Dan it's liquor is slightly darker in color and stronger in taste. The infusion is golden yellow and thus darker than other white teas. 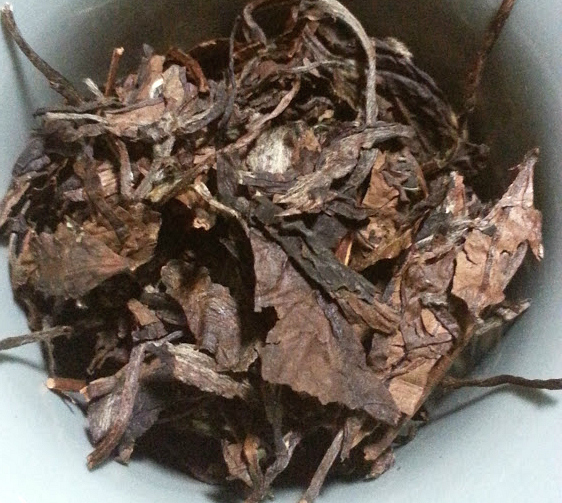 Gong Mei is sometimes also referred as Shou Mei although the latter is considered as fourth grade quality while Gong Mei is a third quality grade tea. Shou mei (younger version): I reviewed this tea here, as a Liu Miao brand shou mei cake, also from that Teeta Talk shop. It's a 2012 tea, for what that's worth, so with a few years of age on it. 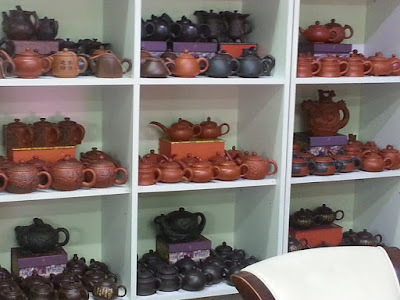 These teas are all going to look a bit similar, the cakes, multi-colored, mixed lighter and darker browns, like fallen autumn leaves, images a bit fuzzy from not putting the effort into photography, etc. I add a bit later guessing the likely best way to break them up versus how I'm doing it. Glancing back at that review post I wrote a good bit about storage conditions there, about what relative humidity really means, about the carrying capacity of level of humidity in air at different temperatures (the absolute versus relative difference), if that's of interest. Shou mei (older version): this is where descriptions are going to get even thinner; this is some random shou mei cake I picked up at that one Bangkok Chinatown shop, Sen Xing Fa, mentioned in this post. I've tried this tea already but didn't review it separately. It was ok, but I didn't like it quite as much as the shou mei version I just mentioned, so I never got around to that. I could tirelessly image-search to find more about it, or use different methods to transliterate the characters, or if all else fails ask the shop what it is, but it doesn't matter. It's shou mei, and the transliterated Chinese name would just be random sounds to me. It says it's from Fuding; that's a good start. I suppose it probably really is a 2008 produced tea but I wouldn't be that astounded if it wasn't; I did just write a review of an obviously fake pu'er from that same shop. How do I know that tea was fake? It was sold as an LBZ for around $20; I bought it as a fake, something I've not tried to do before. candy bar style compressed white: I'm not sure what this is. I bought it at the Sen Xing Fa Bangkok Chinatown shop too. It was supposed to be a few years old (5?) but I don't remember much for specifics. It just looked different and interesting. From trying it before I know it's about as solid as any highly compressed sheng tuocha so it takes awhile to get the infusion process going. I'm wondering if that doesn't limit changes due to aging, but then I guess I only need to wait a half dozen years and I'll know that. Based on already trying this it's not great tea but it's ok. If it was the only compressed white tea someone had ever tried it may seem better for the novelty but I liked the other versions better, and it's hard not to compare like that. Someone just asked me: what is white tea? Starting that far back for this post could turn this into a long read but I will touch on that, then skip across a few other related points. 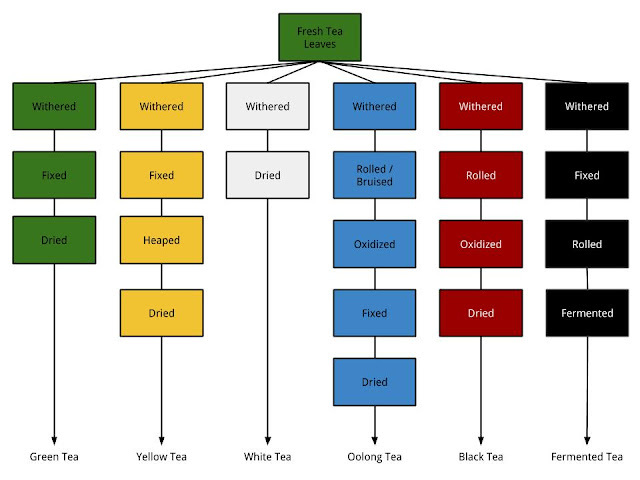 "White" is a main tea type, along with green tea, black, oolong, and hei cha / dark tea. Sometimes yellow tea is added but it's not so common now. I've only tasted one of those, and since it was a South Korean yellow tea there's a decent chance they interpreted the processing and style a little. The general idea behind white teas is that they're processed less. Green teas are heated in some way to stop an oxidation process early on ("fixed," fried or steamed, although I guess any heating would do), so they stay green. Of course it's not so much about the color, but about specific compounds not changing, affecting taste and perhaps health benefits. That last part is a real potential issue but I don't tend to focus on it, since research doesn't seem to clarify the related facts of the matter at all. 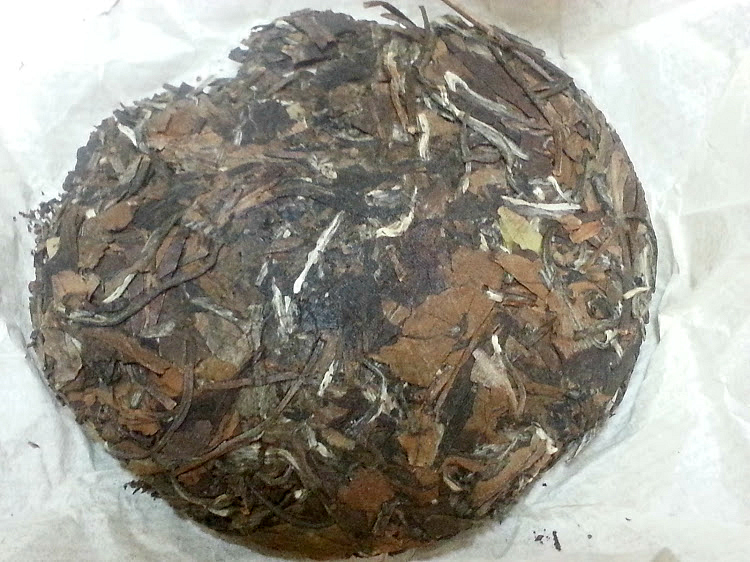 Black teas are roughed up a bit (rolled, to allow for air contact with the internal compounds), then allowed to oxidize, to brown, a combination of enzymes with air, specifically with oxygen. Whites are sort of just left to dry compared to those, although nothing is ever quite that simple. 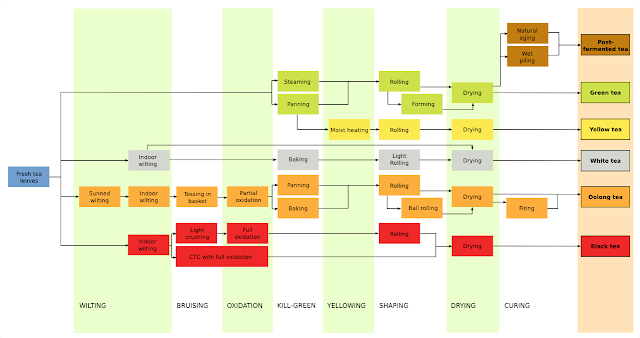 These two tea processing charts only mention one potential variation in processing but some reading up would surely fill in plenty of additional complexity, which I won't read up on or mention here. Onto some other background issues. 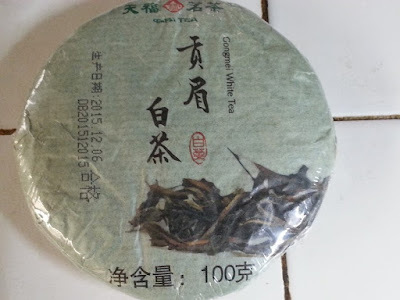 White tea as compressed tea: why compress this in the first place? Who knows. Why not compress it? Compressing teas was used for helping store and transport tea at one point, very early in the history of tea, per my understanding, and some related practices stuck around. It wouldn't be exactly the same if it hadn't been compressed but it might not be that far off this either, relatively speaking, or at least that's my expectation. In contrast to that I just tried some sheng pu'er maocha a vendor shared, essentially just a loose version of the finished tea, and that vendor said that re-steaming the tea and compressing it into a cake (bing, if you prefer) does tend to change it's character to some extent. 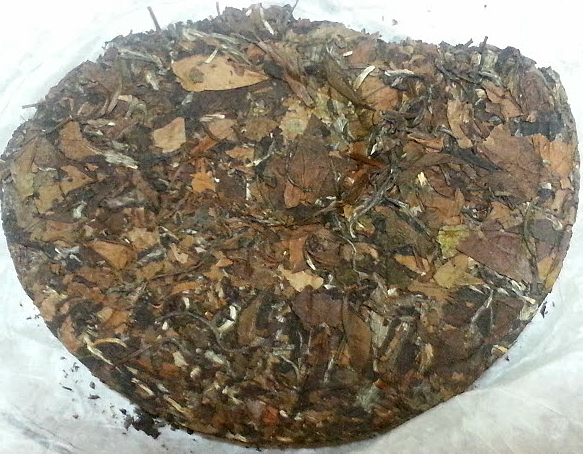 Aging tea: these are different ages; there is a bit of correlation with compressing a tea and aging it. The standard story with hei cha and pu'er--pu'er is hei cha, unless you think it's somehow outside that category, then it's not hei cha, do what you will with concept use--is that later in the history it was discovered aging helped the tea mature, to ferment and improve. White tea sort of does the same, or so the story goes. It's complicated to consider if compressing a tea helps it age in any way, since that would just reduce air contact, so I just won't address that. I researched storage and fermentation issues for a post and mentioned a fascinating article on what the latter really is (my take: the influence of bacteria and fungus living out their life cycle). Rinsing tea: these ideas sort of all connect, as I'm presenting them. In that article on aging tea the one research paper says that a rinse helps remove traces of toxins created in those biological processes. No need to panic, the tea is safe, even if you drink a ridiculous amount of it. But a rinse makes it a little safer, so why not. Should you rinse aged whites? There is no clear consensus on that but why not. Unless you don't want to. How bad could traces of toxins be? Straining tea: you can; the dust and flecks that get in the cup don't add much to the experience. Or you can not; they don't take much away from it either. Being into gear and presentation "tea people" almost always would strain it. The sloppiness suits me so even though I have a few devices around that would work well for that I may or may not; it goes with how I feel at the time, so almost always not. But then I'm no role model. If you ate the tea nothing bad would happen, it just wouldn't make any sense to eat it. How to break off tea: it's best to help compressed teas flake off in sheets, more or less, to not shatter the leaves by pulling off a cubic chunk. A pu'er knife can help with that but it's not so necessary for loosely compressed versions. I have one, somewhere, but I haven't seen it for awhile. A letter opener would also work, or I guess a butterknife would do in a pinch (although it would be best if it was shaped exactly like a pu'er knife, which wouldn't tend to come up by chance). 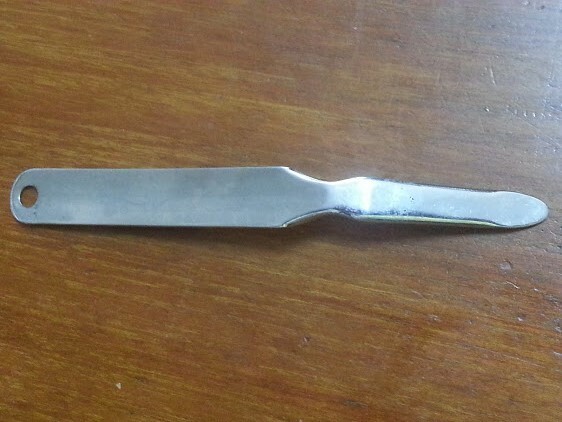 I found a letter opener next to this comparison tasting set-up during cleaning up so I took a picture of it. 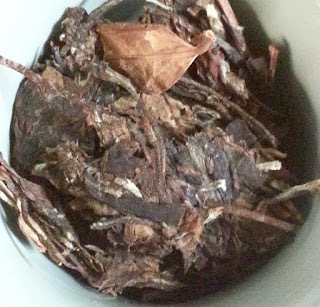 But then all that matters more for pu'er, when you might want to limit the astringency and retain a really clean profile by not ripping up the leaves. 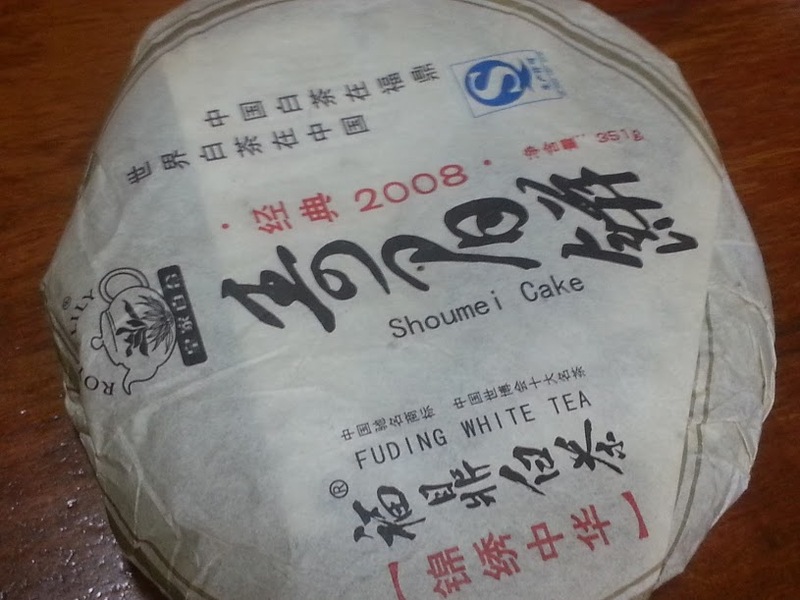 I've been giving away parts of these white tea cakes and tend to do the opposite, to tear off sections, because that retains the original look of a compressed tea for someone else to see. I'm giving away tea for people to experience something new, and getting a sense of the original shape is part of that, not so much for people that know the teas already to experience. Aging effect on tea: we'll see, I guess. Without trying the teas at time of origin I would have no idea. I've heard the teas get fruitier and sweeter after around a decade but who knows. That might well depend on the tea, and storage conditions, and maybe even more so on interpretation, on someone carrying a bias towards tasting something in particular into the experience. Comparing these teas and guessing about that factor as an input isn't likely to work. 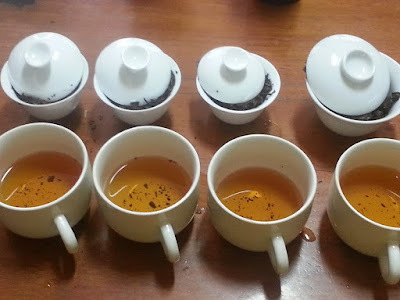 Tasting four teas at once, related to quantity: I ran across a problem with this tasting silver needle style white teas not long ago (in this post), related to taking in too much caffeine. Better to go with the small gaiwans, if that's an option, but I only have three of that size. This time I plan to not cycle through 10 infusions each, too, to sweep these aside into a combined cold brewing steep to drink some other time after the effects start to kick in. Brewing process / parameters: I tend to guess all that out. You don't need to flash infuse white teas, relatively speaking, easing up on times to limit astringency or bitterness as in young sheng. Some people brew white teas for a long time to get the infusion strength (the flavor part) up to where it would be for most other types, or they also tend to be ok prepared lightly, brewed fast. I'll probably just use 30 seconds to one minute infusions for these, varying it a little to see how that changes things, and probably won't really use a progressive increasing-time cycle. 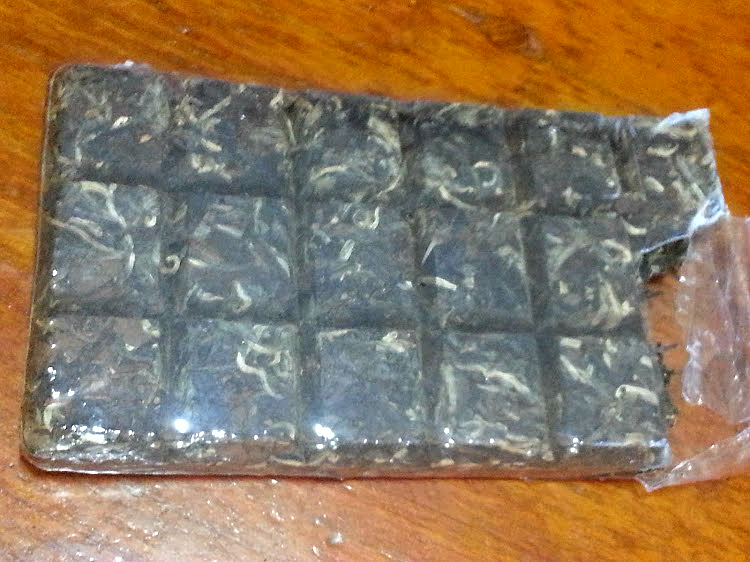 The one candy-bar shape tea is pressed like some sort of floor-board material so I'll need to give it more time to open up, but the rest are accessible. White tea gives you some flexibility; you can brew it however you want, because they tend to work well at different strengths. A lot of oolongs are like that, or soft black teas, but some oolong types are nothing like that. 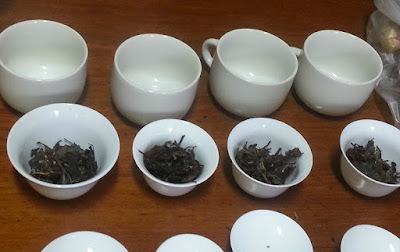 With Dan Cong and Wuyi Yancha you generally tend to go lighter and aim for an optimum, or really any tea could have a specific optimum per personal preference, it might just vary by person what that is. I like white teas brewed on the lighter side, I guess, but not as lightly as some other types. Really these are from after an initial rinse, which I also tried, but didn't write about. It was kind of like running a warm-up lap. After all that about the toxins I still did drink those, although in retrospect given the caffeine issue I probably shouldn't have. Gong mei: this tea is nice! It's soft and full, a bit sweet, with a good bit going on, for the general type being so subtle. I want to say it's fruity but it'll be hard identifying a fruit. 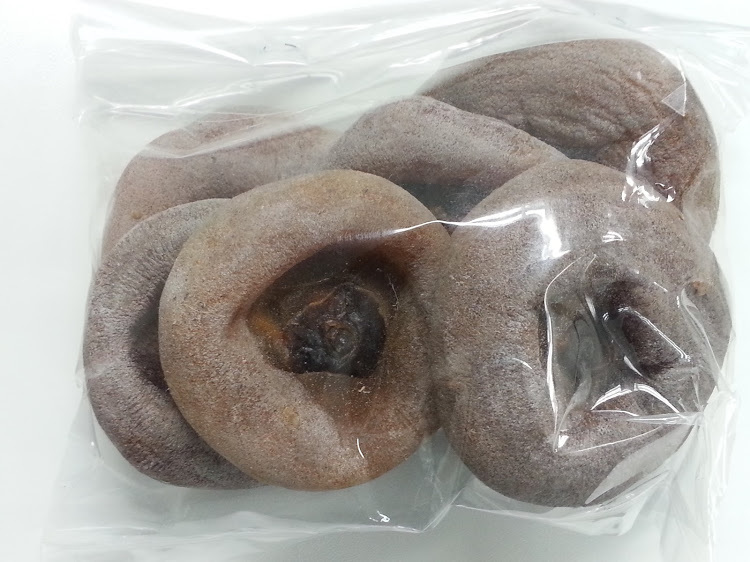 Maybe initially it reminds me a little of dried tamarind, just to cite a range. There is a little earthiness, kind of the standard context, but it's hard to pin down, not woody, exactly, maybe how aged parchment paper would taste, but still clean in effect. 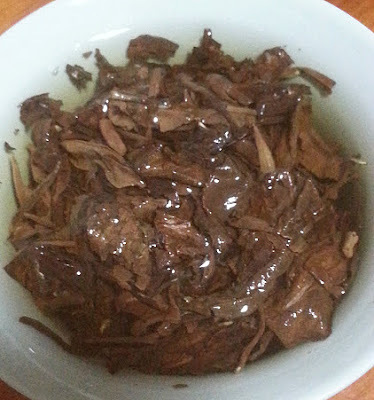 Shou mei (younger): also nice, not quite as bright and clean. It's harder to appreciate that difference without tasting the two side by side like this. It's also fruity but towards spice from a more conventional expression of that, towards the root in root beer. It's just a little woodier. Shou mei (older): this has a little funkiness to it. I don't mean that it's off, but it is different. It's towards a light, sweet expression of dried wild mushroom, maybe. Or maybe closer to a tropical dark wood tree bark, and somehow that sounds better. It's not bad, but unusual. The cleanness slips down a little across this whole tasting sequence, really kind of how I arranged these, from an expected most favorite to least favorite. Candy bar style: different, again. One aspect reminds me a little of coffee--that's different. I let it brew twice as long because it doesn't open very fast, so in a sense that certainly threw off a balanced comparison, which was actually impossible with the teas not unfolding at similar rates. It's probably the least clean and bright / most murky in effect, but still decent tea. It's not bad, with that coffee aspect drifting a little towards cocoa, just well off what these other teas are doing. For the third infusion I'll go around a minute soak again, thick enough to not be grasping at subtle aspects. I'm feeling these teas already; maybe two more infusions should be plenty, and that cold-brew experiment as a second part really could be medicinal strength if I'm not careful. There is a lethal dose amount of caffeine but long before you get to that it can seem like too much. About 5 grams might kill you, perhaps 100 cups of tea, something to keep in mind. And it doesn't pass out of your system very fast, or at least mine, it can make for an all-day ride. Gong mei: the tea didn't pick up intensity or transition much. It's nice how clean the flavors are, how it all comes across and balances, but it's not exceptional in terms of any one aspect or a set. Maybe it's just my imagination, and the power of suggestion from just mentioning a related aspect, but I seem to pick up an underlying trace of wintergreen that fills in with the mild fruit and subdued spice / earthiness that gives it a bit more complexity. If so it is quite subtle. If someone didn't like subtle teas, which would be quite a reasonable thing, then they'd not like this one. I can be put off by silver needle styles that don't seem to have much going on but the complexity of the context layer of these works for me. It's not that there's not much to experience, it's just not in your face, instead complex in a subtle way. 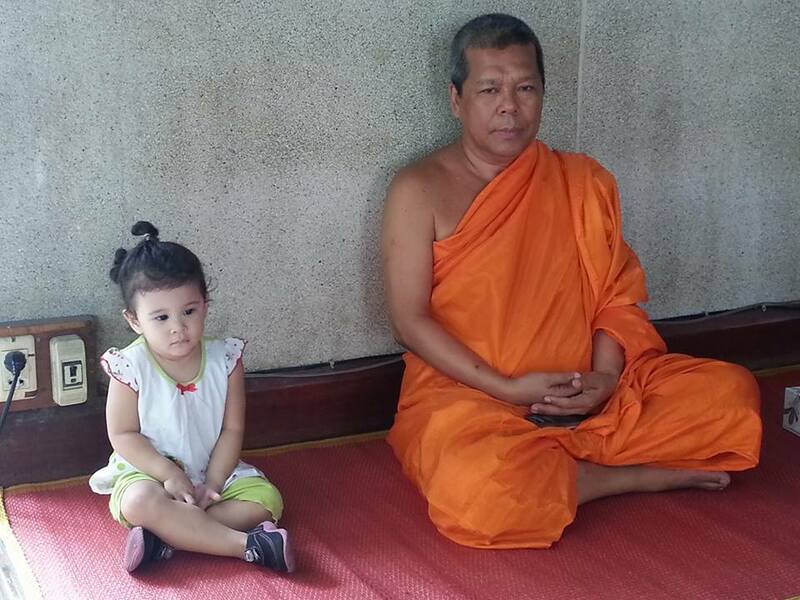 Shou mei (younger): all of that general commentary can apply to this tea too. It's a little thinner in effect though; there's slightly less to experience. It's still quite clean in effect, and to me that makes earthiness work much better. Add a bit of murkiness / peat / mushroom / oxidized aluminum (kind of joking related to that last one, but not completely) and this wouldn't work. Distilling this to a flavors list is tough. The earthiness is a little like a tree bark, the fruit a little like a dried persimmon. But those are subtle, and I'm not capturing the complexity saying it tastes like those two things. Shou mei (older): this did transition; way different. Now that is tree bark, just a bit towards aged leather from that. It has a touch of fruitiness but it's hard to sort out under that earthiness. It might be more like an aromatic bark spice under an earthier, heavier tree bark. The woodiness is towards cedar, or maybe redwood. It's not bad but it wouldn't be for everyone. The flavor is still a bit clean but not like the first two. This could almost pass for something other than tea but I'm sure it's tea. 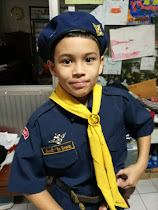 Aging might have changed it; this is supposed to be nine years old. Candy bar: I went with the same infusion time for this one this time (around a minute) so it lightened. It's closest to the third, of the other three, but still tasting a bit like coffee. Kind of strange, really, who would buy a tea intending it to taste like coffee, since there is another beverage option for that. It has a slight toastiness to it too, and a touch of cocoa, so at least it's interesting. It's hard to imagine someone preferring this tea version from the rest in this set but I guess that is possible. If shou was someone's favorite tea type this would be the one that rings a bell. It's still ten times more subtle than any shou, so to be clear I'm talking about within a compressed white tea range here. It has some sweetness but the last two gave up a little to the first two related to that. That doesn't match the idea that teas would sweeten as they age, since the first tea in the set is the youngest (the gong mei is 3 years old), the third the oldest, and second and and fourth about the same (both probably around 5 years old now). The caffeine is going to add up, and I've been tasting teas for awhile and have things to do, so this will have to be it. 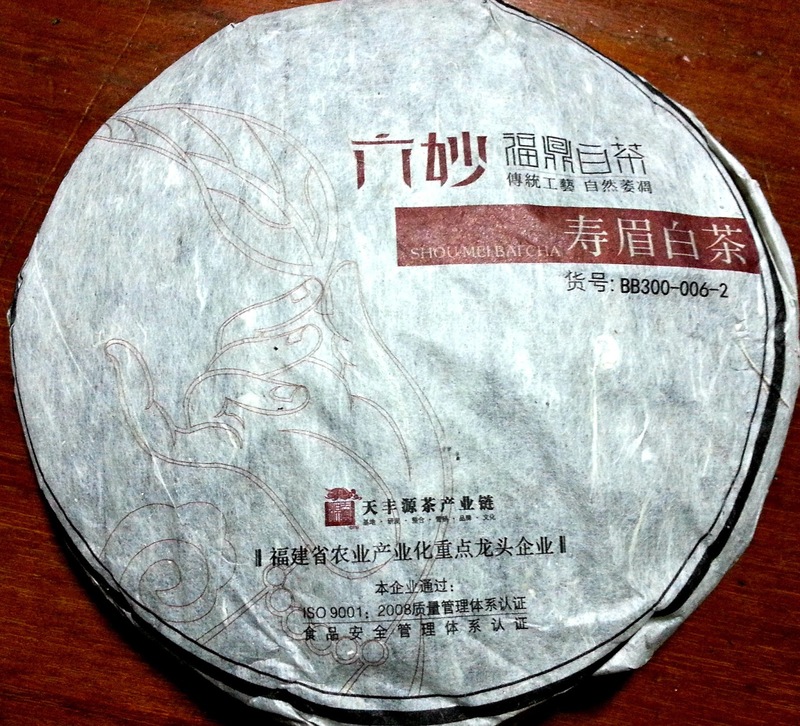 Gong mei: the tea is thinning a little; it seems early for that. The general effect is still nice and it just seems to be tapering off slightly, not transitioning. I'm sure it can brew a few more by stretching the time but it doesn't seem like it's going anywhere for changes. 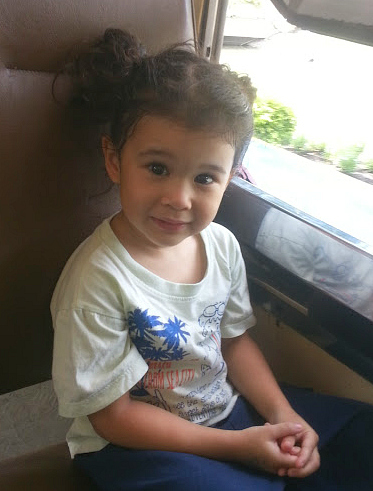 Shou mei (younger): the same for this one. Maybe compressed white teas aren't as interesting for expressing transitions as some other types, in general. A lot of the effect is subdued too, a base of rich, complex flavors, but not something that stands out as a list as for some other types. I guess I'm saying they're not perfect for review description, but the experience is still interesting, if someone is on that page. Shou mei (older): this tea is changing a little, moving more to root spice off heavy wood and tree bark. Maybe those few extra years did lend it more complexity, at the cost of coming across a bit extra earthy in the first few rounds. I'm not sure though; I'd have needed to try it when young to know. Candy bar: this one is just thinning. That coffee / earthiness / cocoa effect doesn't work as well thinner, but it would be possible to bump that with longer infusion time. It's not just about intensity but also depth of the experience, the range, and it wouldn't work to get that richness back, even if it was stronger. This just isn't as good a tea as the first two, and the third probably depends on preference related to it being the best or the worst. It was the most complex but in an earthier range. I like these teas, the first two the best. 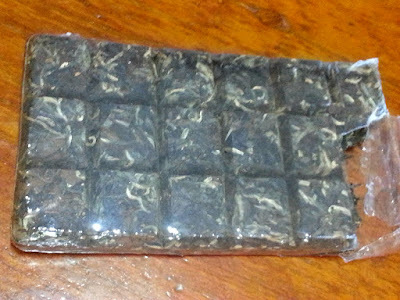 It's nice that I like the gong mei since I paid twice what I did for the younger shou mei for it, or rather the same amount for half as much tea (just under $20 for 200 and 100 grams; still a decent price for both). 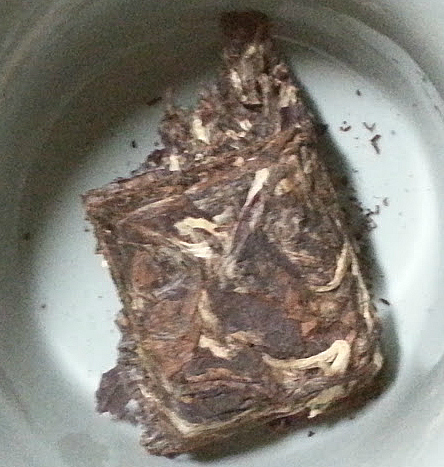 I think my intuition did well in selecting that first shou mei; it probably was one of the more interesting teas and better values in that Teeta Talk shop (as if I'd really know that). I think if someone tried white teas for the first time all of these might seem a little thin, too subtle. It takes some adjustment to appreciate the range. It's not the same kind of adjustment it takes to crave a sheng that tastes like tasting an aspirin, quite the opposite, but to me a light oolong or soft black tea makes for a more reasonable starting point. Even shou can work as a starting point if the earthiness--tasting like a crude oil soaked chunk of peat--matches personal preferences in some odd way; there is no finer level of appreciation to dial in related to liking or not liking those. These teas could all ramp up intensity just by giving them a longer soak, and in a limited sense they would push more towards the range of a black tea for doing that. That sense would be quite limited; the astringency would never be the same, and the taste range couldn't shift. Brewed stronger this set of aspects is still going to seem subtle in a different way, just stronger, and the effect of feel might thicken a little. I like all of them, and it will be interesting to see if they change with more age. I have enough I don't mind sharing them too; I've passed on some to two local monks to try out not so long ago. Some feedback from one: he thought it was interesting but likes pu'er better. Another I didn't talk to about it but he's more into oolong anyway.